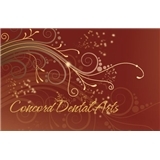 Concord Dental Arts (Concord) - Book Appointment Online! Dr. Shirazi stays current with the modern dental advances and constantly incorporates the latest techniques at Concord Dental Arts. She has recently introduced Soft tissue Laser and Invisalign to enhance the patient experience with convenience and comfort. Furthermore, Dr. Shirazi has extensive training in the field of implant dentistry. She earned her implantology certificate from New York Oral Implantology.